Available via a quick and simple software update, virtual No-Go Lines put you in control so your robot cleans the areas you want, and more importantly, doesn’t go to areas you designate as “no-go”. Worried about pet bowls, a pile of toys, or the holiday decorations you just set out around the house getting in the way of Neato’s cleaning cycle? No problem – with just a few swipes on the floorplan map in your Neato app, you can block off areas where the robot shouldn’t go and feel a whole new level of freedom and flexibility in programming your robot. Achieve a more convenient and careful clean every day thanks to this new feature. If you have a multi-story home, you’ll love the multiple floor plan feature. It lets you create up to three floor plans so you can add No-Go Lines on each story for a personalized cleaning experience. Eco mode is great for everyday cleaning and Turbo mode provides a more powerful clean. If needed, now your robot can top off its battery mid-clean with just enough charge to finish the job with Quick Boost Charging.1 No need to wait for a full charge when there’s only one room left to clean. Neato now knows your floor plan and can complete the job in the most efficient way possible. Software version 4.3.0 begins rolling out to Botvac D5 Connected owners today, bringing more value and personalization to your cleaning experience. The roll out of robot software version 4.3.0 to Botvac D5 Connected is expected to be completed by the weekend. Later this Fall, Botvac D3 Connected owners will also receive a software update to enable No-Go Lines. 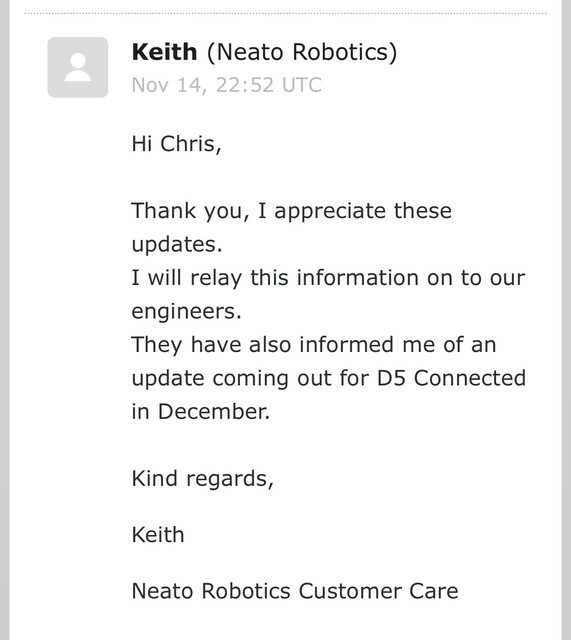 And Neato says they're not gonna update the Botvac Connected which is even more expensive and was said to be the flagship even when D5 came out. Grr... damn you, Neato! really hoping this update fixes an issue with my D5 where it pathologically avoids two areas of my apartment. so so annoying. Thats a nice suprise that they included turbo/eco modes too! They didnt say anything about that earlier, only no-go lines and quick boost charging. No update available for my D5 yet. Anyone here with 4.3 updated D5? Im assuming that the main brush speed increase will be 200rpm, so eco is going to be 800rpm, while todays "normal clean mode" 1200rpm will be updated to turbo mode with 1400rpm brush. Vacuum power eco should be 65% and turbo should raise the vacuum power to 80%, when earlier updates normal clean mode has 65%. Last edited by HiTec on November 10th, 2018, 5:01 pm, edited 2 times in total. Just got the update. Took two tries to update. At first try robot rebooted after the update and connected the wifi correctly, but the version didnt change, so something went wrong and robot reverted back to previous version. Second try the update went fine, but after the reboot robot didnt connect to wifi without reset procedure. After that everythings fine. Much faster update process than 4.2.3, so i think that was an bigger update that prepared things for this 4.3.0 version, as well as fixed some unknown bugs. Robot has been running an "floor plan learning run" fo about 20 minutes right now without problems. Edit: Floor plan creation went smoothly and now the no-go lines work perfectly. Turbo and eco modes dont have as big difference in loudness than there is in original Botvac Connected. I will hook the robot to NeatoControl tomorrow and check what are the turbo/eco parameters. There is no difference in VacuumPwr and VacuumPwrEco modes? Main brush speed is the same as previous update, as well as main brush eco mode? There is no "real" turbo mode here. Thats why there seems to be no audible difference in turbo and eco modes! Seems that turbo mode is normal mode and only eco mode is enabled. Disappointment is a one word how to describe this and false advertising is one sentence. "Increase suction power and brush speed with Turbo mode", says Neatorobotics D5 page. This update doesnt increase a sh**. It just added ECO mode that only differs from "Turbo" mode by lowering brush speed a 400rpm. And they are claiming that this update increases cleaning power. [quote="HiTec"]Just got the update. Took two tries to update. At first try robot rebooted after the update and connected the wifi correctly, but the version didnt change, so something went wrong and robot reverted back to previous version. Glad to see they are updating older units with no Go Lines. I have the D3 but have not yet been updated. The D5 should be updated by this weekend. Hopefully they will start the D3 update soon. How useful are the no go lines? Do they live up to the hype? They are very usefull! I still use mag strips for extra safety around cat food/water bowls, because i dont know what happens if network connection is lost. I just got a confirmation from Neato Support that they indeed re-named the Normal mode to Turbo and only added ECO mode. So "Increase suction power and brush speed with Turbo mode" is only real if you compare that to ECO mode. No changes have been made to brush/vacuum configuration files. With these updates, I wonder if there is really any difference now between the D5 connected and the D7 connected. The features seem very similar now. D7 has zone cleaning, better turbo mode (D7 has faster brush/more powerfull vacuum), manual drive, 5ghz wifi. Yea, i should have said zone cleaning is here in any minute, because 4.2.3 is already introduced and in D5 they quickly rolled out the 4.3 update after the "bug fix" update. btw, there's another D5 update coming in December. Contents unspecified. Good to know! Where did you find that information? Thanks for the info! I hope the new update will fix the problem.